separates both small and large pre-scored PCBs. ensure that the side strips fall through and are sorted out. The PCB is placed with its pre-scored groove onto the linear blade and circular blade is then drawn by hand across the PCB. The clearance between the upper guide and the linear blade is adjustable to ensure that the PCB is only separated in the pre-scored groove. The pre-scored grooves can be interrupted by any number of cutouts. 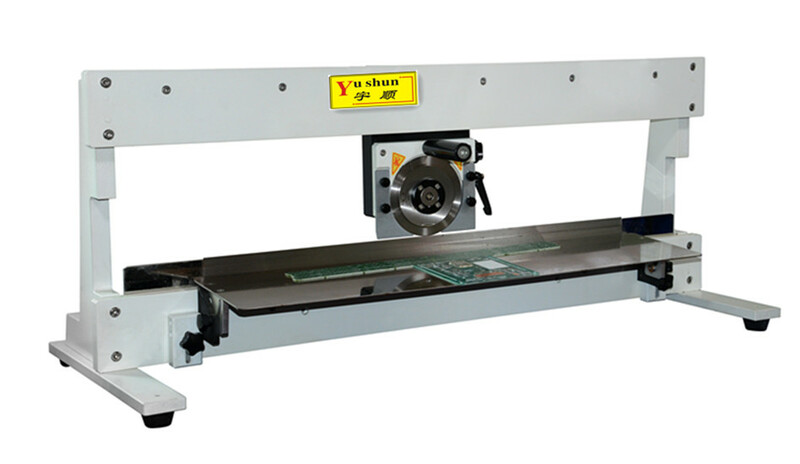 If components project above the groove,the linear blade needs to be cut out, in such a case,contact us. Circular blade cuts against the linear blade to ensure clean, burr-free processing without board stress. Will depanel PCBs with components 1mm from the score line. Quick-lock design for easy circular blade setup to any PCB thickness. Large processing table, which can be angled to permit processed boards to fall away. Standard cut length of 480mm. 720mm also available.